A new year at the University of Stancester, and Lydia Hawkins is trying to balance the demands of her studies with her responsibilities as an officer for the Christian Fellowship. Her mission: to make sure all the Christians in her hall stay on the straight and narrow, and to convert the remaining residents if possible. To pass her second year. And to ensure a certain secret stays very secret indeed. When she encounters the eccentric, ecumenical student household at 27 Alma Road, Lydia is forced to expand her assumptions about who’s a Christian to include radical Quaker activist Becky, bells-and-smells bus-spotter Peter, and out (bisexual) and proud (Methodist) Colette. As the year unfolds, Lydia discovers that there are more ways to be Christian – and more ways to be herself – than she had ever imagined. Then a disgruntled member of the Catholic Society starts asking whether the Christian Fellowship is really as Christian as it claims to be, and Lydia finds herself at the centre of a row that will reach far beyond the campus. 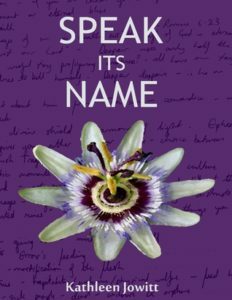 Speak Its Name explores what happens when faith, love and politics mix and explode. This is probably a book best enjoyed by people who have connections to Christian communities or have an understanding of them. However, if anyone wants a glimpse into the world of conservative evangelical Christianity, this is an excellent example of what it looks like. It’s also a good read for straight Christians who want to understand what it’s like to be LGBTQ within those conservative spaces. It’s hard to categorize my own feelings after reading this. At times, it was so familiar as to be painful. Because this is set in the UK and I’m in the US, I spotted some distinct cultural differences, particularly with the university system. However, every last detail about the Christian Fellowship group was achingly familiar, right down to the lingo, the statement of belief, and the narrowly specific teachings. It was enough that I cringed with apology for Americans having exported this brand of faith. This is not a fast-paced story. It’s a slow-bloom both regarding Lydia’s expanding definition of what it means to be a Christian and her romance with Colette. I was both surprised and yet not at the way the faith-based politics played out in the story as well as Lydia’s role in it all. Once again, it felt horribly familiar. Yet there was comfort in the realization that we who have been through similar things are not alone. One thing I particularly liked was seeing the characters struggling to make sense of Lydia’s orientation but seen from her perspective. A lot of Christian novels on LGBTQ issues are about Christians trying to figure out what to do with their gay friends and family, but they aren’t told in the words and thoughts of the gay person themselves. It was a good change of pace watching it happen from inside, from Lydia’s point of view, and seeing the different reactions in contrast with each other. This is an ideal read for anyone trying to make sense of Christian faith and being LGBTQ or being friends and family of LGBTQ people. The characters and setting feel real, and it’s so well-written with rich detail. It could be difficult for some readers to revisit a painful past, but others will find a kinship with Lydia and her group of friends. Kathleen Jowitt: author of Speak Its Name, English graduate, cyclist, eco-worrier, bisexual, Christian humanist of the Broad Church Anglican variety, liberal socialist, trade unionist, lover of hats, Quaker sympathiser, and slightly bewildered Cambridge resident.